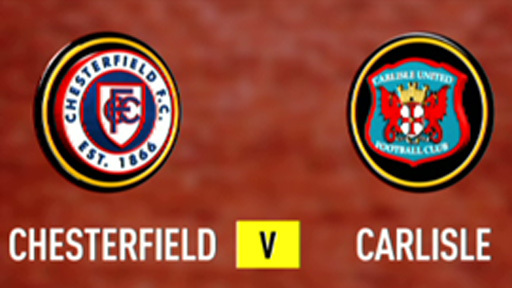 Carlisle came from a goal down to beat Chesterfield and reach the Johnstone's Paint Northern Section semi-final. The home side lost Gregor Robertson to a suspected broken leg but took the lead through a Darren Currie penalty after Tom Taiwo fouled Scott Boden. An Ian Breckin header hit the bar for Chesterfield before Carlisle levelled when Matt Robson nodded in. Peter Murphy headed in a corner to put the visitors ahead and Adam Clayton's 15-yard strike sealed Carlisle's win. "Obviously it's disappointing to go out of two cup competitions in the space of four or five days. "Looking at the game, I thought we were in control and looked as if we were going to increase the lead but we've given very bad goals away. "You've got to defend your box. We never did that." Correction - 90:00+3:42 Marc Bridge-Wilkinson takes a shot. Tommy Lee makes a save. 90:00+3:42 Matthew Robson takes a shot. Tommy Lee makes a save. 90:00+1:59 The ball is swung over by Dan Gray, Danny Livesey manages to make a clearance. 90:00+1:51 Scott Boden crosses the ball, blocked by Evan Horwood. 90:00+0:26 Kevin Austin produces a cross, Danny Livesey manages to make a clearance. 89:41 Robert Page challenges Matthew Robson unfairly and gives away a free kick. Matthew Robson takes the direct free kick. 89:12 Shot from just outside the box by Joe Anyinsah misses to the right of the target. 87:29 Direct free kick taken by Adam Collin. 87:29 Booking Mark Allott is shown a yellow card. 87:19 Unfair challenge on Richard Keogh by Mark Allott results in a free kick. 84:29 Free kick taken by Adam Collin. 84:29 Substitution Dan Gray is brought on as a substitute for Derek Niven. 84:29 Substitution Jordan Bowery comes on in place of Drew Talbot. 84:29 Jack Lester is ruled offside. 83:44 Matthew Robson takes a shot. Save by Tommy Lee. 83:04 Joe Anyinsah fouled by Kevin Austin, the ref awards a free kick. The free kick is swung in right-footed by Marc Bridge-Wilkinson. 79:25 Joe Anyinsah takes a shot. Save made by Tommy Lee. 77:41 Matthew Robson provided the assist for the goal. 77:41 GOAL - Adam Clayton:Chesterfield 1 - 3 Carlisle Adam Clayton fires in a goal from inside the penalty box to the bottom right corner of the goal. Chesterfield 1-3 Carlisle. 76:56 Inswinging corner taken right-footed by Darren Currie from the left by-line, clearance made by Danny Livesey. 76:45 The ball is crossed by Phil Picken, Tom Taiwo manages to make a clearance. 75:26 Free kick crossed right-footed by Darren Currie from left by-line, Tom Taiwo manages to make a clearance. 75:26 Booking Joe Anyinsah is shown a yellow card for unsporting behaviour. 75:01 Joe Anyinsah concedes a free kick for a foul on Darren Currie. 74:17 Free kick awarded for an unfair challenge on Ian Breckin by Richard Offiong. Robert Page takes the free kick. 73:34 Free kick awarded for an unfair challenge on Richard Keogh by Darren Currie. Direct free kick taken by Adam Collin. 72:19 Jack Lester gives away a free kick for an unfair challenge on Evan Horwood. Adam Collin restarts play with the free kick. 71:53 Derek Niven fouled by Joe Anyinsah, the ref awards a free kick. Tommy Lee takes the direct free kick. 71:21 Jack Lester concedes a free kick for a foul on Peter Murphy. Free kick taken by Adam Collin. 70:32 Substitution Vincent Pericard leaves the field to be replaced by Richard Offiong. 70:03 Corner taken right-footed by Darren Currie, Adam Clayton makes a clearance. 69:50 Mark Allott takes a shot. Peter Murphy gets a block in. 69:31 Free kick awarded for an unfair challenge on Robert Page by Matthew Robson. Direct free kick taken by Robert Page. 68:19 Marc Bridge-Wilkinson provided the assist for the goal. 68:19 GOAL - Peter Murphy:Chesterfield 1 - 2 Carlisle Peter Murphy scores a headed goal from deep inside the penalty box. Chesterfield 1-2 Carlisle. 66:09 Jack Lester takes a shot. Save made by Adam Collin. 65:15 Effort on goal by Richard Keogh from outside the penalty box goes harmlessly over the bar. 65:04 Joe Anyinsah sends in a cross, clearance by Derek Niven. 63:25 Substitution Peter Murphy joins the action as a substitute, replacing Ian Harte. 63:11 The ball is delivered by Matthew Robson, Robert Page manages to make a clearance. Correction - 61:07 The assist for the goal came from Tom Taiwo. 61:07 Assist by Tom Taiwo. 61:07 GOAL - Matthew Robson:Chesterfield 1 - 1 Carlisle Matthew Robson grabs a headed goal from close range. Chesterfield 1-1 Carlisle. 60:04 Substitution Marc Bridge-Wilkinson is brought on as a substitute for Kevan Hurst. 59:44 Scott Boden takes a shot. Ian Harte gets a block in. 58:23 Corner taken by Darren Currie from the left by-line, Ian Breckin takes a shot. 57:21 Darren Currie takes the outswinging corner, Drew Talbot takes a shot. Save made by Adam Collin. Outswinging corner taken by Darren Currie, Adam Collin makes a save. Darren Currie crosses the ball, save by Adam Collin. 57:15 Drew Talbot sends in a cross, Evan Horwood gets a block in. 55:28 Centre by Adam Clayton. 51:50 Drew Talbot produces a cross. 51:26 Jack Lester takes a shot. Save made by Adam Collin. 49:42 Kevan Hurst produces a cross, save by Tommy Lee. 49:08 Foul by Darren Currie on Kevan Hurst, free kick awarded. Direct free kick taken by Adam Collin. 49:01 Centre by Darren Currie, clearance by Ian Harte. 47:31 Tom Taiwo takes a shot. Ian Breckin gets a block in. 46:58 The ball is swung over by Scott Boden, Richard Keogh manages to make a clearance. 46:47 Derek Niven crosses the ball. 45:00+9:08 The ref blows to signal half-time. 45:00+8:28 Jack Lester takes a shot. Adam Collin makes a save. 45:00+7:53 Foul by Matthew Robson on Derek Niven, free kick awarded. Robert Page restarts play with the free kick. 45:00+5:44 Foul by Evan Horwood on Scott Boden, free kick awarded. Direct free kick taken by Robert Page. 45:00+4:27 Assist by Derek Niven. 45:00+4:27 GOAL - Darren Currie:Chesterfield 1 - 0 Carlisle Placed penalty scored by Darren Currie. Chesterfield 1-0 Carlisle. 45:00+2:46 Tom Taiwo concedes a Penalty for a foul on Derek Niven. 45:00+2:20 Outswinging corner taken right-footed by Darren Currie from the right by-line, save by Adam Collin. 45:00+2:07 Drew Talbot takes a shot. Danny Livesey gets a block in. 44:17 Matthew Robson delivers the ball. 43:28 The offside flag is raised against Jack Lester. Free kick taken by Adam Collin. 42:29 Jack Lester takes a shot. Save by Adam Collin. 41:12 Shot from just outside the area by Adam Clayton goes over the bar. 40:59 Centre by Phil Picken, clearance by Ian Harte. 40:33 Free kick awarded for an unfair challenge on Robert Page by Joe Anyinsah. Robert Page restarts play with the free kick. 39:56 Kevan Hurst concedes a free kick for a foul on Darren Currie. Mark Allott restarts play with the free kick. 39:05 Joe Anyinsah takes a shot. Ian Breckin gets a block in. Joe Anyinsah has an effort at goal from just inside the box that misses to the right of the goal. 38:45 Darren Currie sends in a cross, clearance by Danny Livesey. 37:22 Vincent Pericard concedes a free kick for a foul on Ian Breckin. Direct free kick taken by Tommy Lee. 36:28 The ball is crossed by Matthew Robson, Kevan Hurst conjures a right-footed shot from inside the six-yard box that clears the bar. 35:31 Ian Harte fouled by Jack Lester, the ref awards a free kick. Direct free kick taken by Adam Collin. 35:09 Vincent Pericard is caught offside. Free kick taken by Tommy Lee. 34:57 Matthew Robson produces a cross, clearance by Robert Page. 34:04 Adam Clayton takes a shot. Joe Anyinsah gets a block in. 33:24 Joe Anyinsah takes a shot. Robert Page gets a block in. Corner taken right-footed by Kevan Hurst from the right by-line, clearance made by Robert Page. 31:22 The ball is swung over by Darren Currie, Foul by Jack Lester on Ian Harte, free kick awarded. Free kick taken by Adam Collin. 30:11 The ball is delivered by Joe Anyinsah, save by Tommy Lee. 29:16 Free kick taken by Darren Currie. 29:16 Booking Booking for Richard Keogh. 29:02 Richard Keogh challenges Drew Talbot unfairly and gives away a free kick. 28:38 Kevan Hurst delivers the ball, clearance by Robert Page. 27:53 Kevan Hurst delivers the ball, Matthew Robson has a headed effort at goal from close in which goes wide left of the goal. 26:46 Substitution Darren Currie comes on in place of Gregor Robertson. Correction - 14:45 Robert Page challenges Adam Clayton unfairly and gives away a free kick. Ian Harte takes the direct free kick. 14:45 Free kick awarded for a foul by Robert Page on Adam Clayton. Free kick taken by Tom Taiwo. 14:20 A cross is delivered by Drew Talbot, save by Adam Collin. 14:00 The ball is sent over by Kevan Hurst, Phil Picken makes a clearance. 12:16 Mark Allott takes a shot. Danny Livesey gets a block in. 11:56 Centre by Jack Lester, clearance by Danny Livesey. 9:17 Joe Anyinsah takes a shot. Save by Tommy Lee. 7:05 Vincent Pericard is penalised for a handball. Free kick taken by Tommy Lee. 4:51 Jack Lester sends in a cross, clearance by Evan Horwood. 2:52 Derek Niven takes a shot. Blocked by Danny Livesey. 1:28 Free kick awarded for a foul by Tom Taiwo on Ian Breckin. Free kick taken by Tommy Lee.